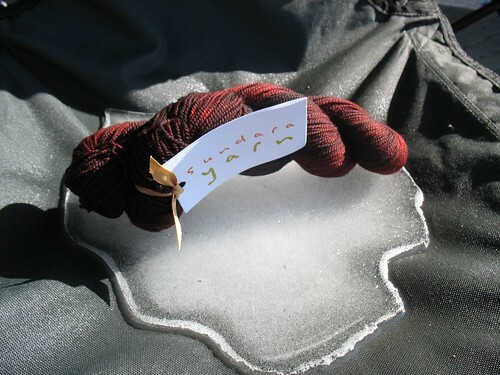 First off, some nice red yarn on ice: my Sundara Sock yarn in Black over Wine. The color is actually a little bit darker than these pictures show, but Photoshop only made matters worse, so I left the photos in their original state. 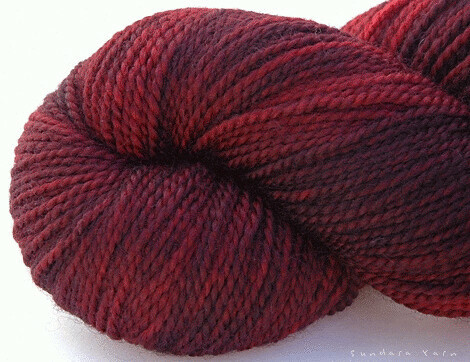 The yarn is really a mixture of deeply saturated blackened reds, like Bing cherries. 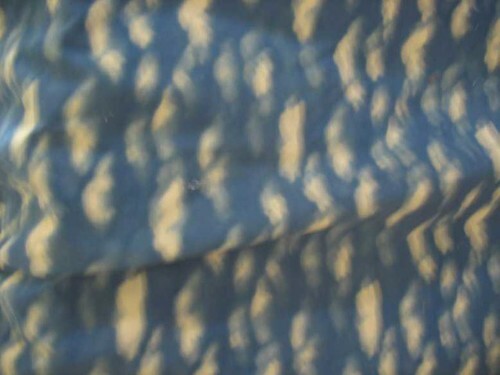 The interesting icy backdrop is the result of our recent rain collecting on our fabric deck chairs and freezing. 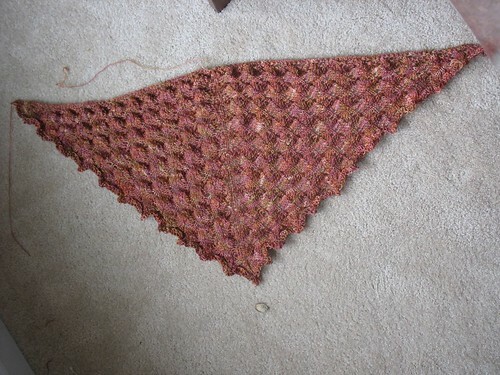 Size: I knit one more body repeat than specified in the pattern (9 repeats total) and ended the pointed edging early. 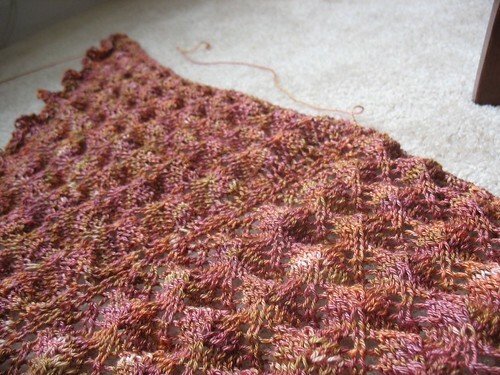 The edging chart goes through 14 rows and I knit only 10, plus the ending row written out in the text. The finished dimensions pre-blocking, in lightly flattened egg-carton state: 40” across top, 18” long. The finished dimensions post-blocking: 56” across top, 26” long. 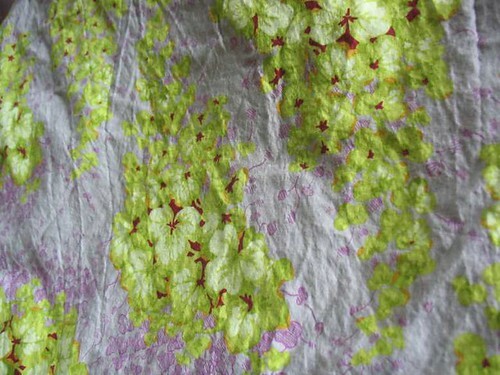 On the small side, but it works well as a decorative garment when pinned shut, not so well when left to drape by itself. 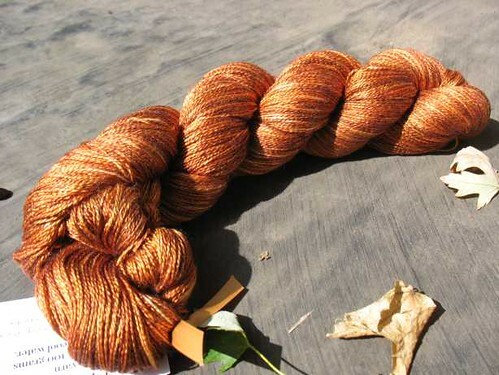 Yarn used: Chameleon Colorworks Twinkle Toes in “October,” a merino-tencel sock yarn. The color looks nothing like it does on the website. 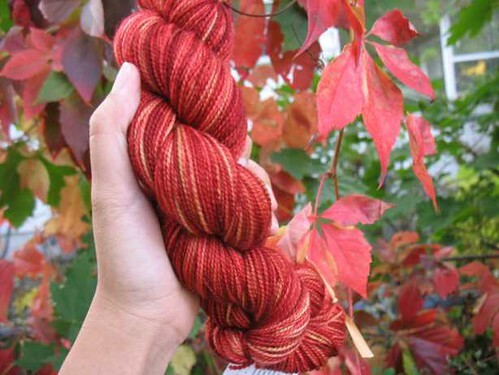 I found this yarn at Imagiknit in San Francisco, back when I visited around Thanksgiving–you may remember the photos of it in the skein. 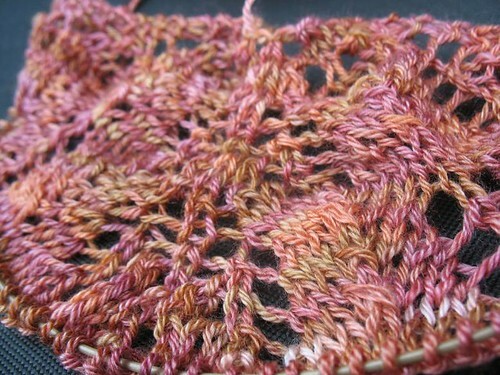 The yarn is pretty, but feels fairly hard and high-twist (that’s good for a sock yarn, I guess, but it was a little surprising, and less desirable for lace). 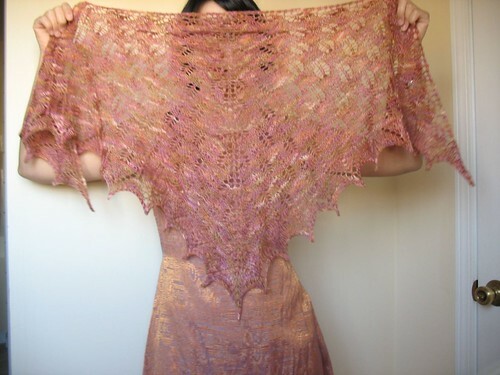 There were a few disappointingly pale spots–not exactly pure white, but a very pale apple-blossom pink that stood out against the mostly darker shades of old gold, tangerine-peach, and damask rose in the rest of the skein. 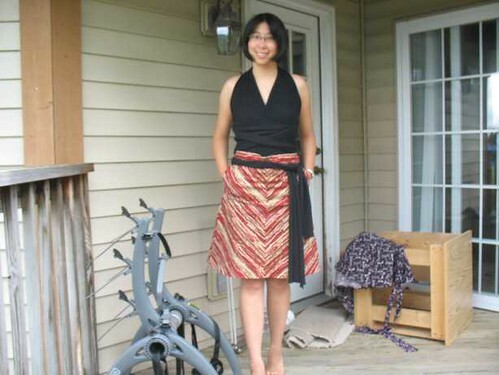 In these photos, the colors are truest in the sunny balcony pictures and the close-up photos of the shawl draped on a rock. Warm, shimmery, nice. 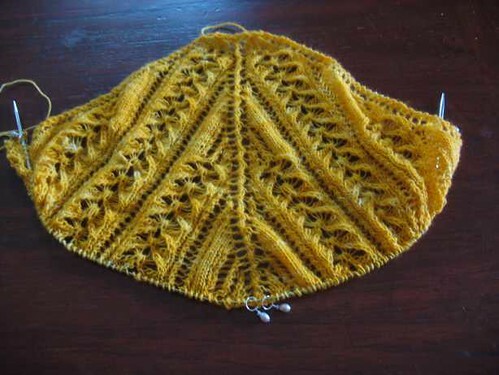 Needles used: US size 6/4.0 mm Addi Turbos for most of the body, US size 8/5.0 mm Denise circulars for the bindoff. 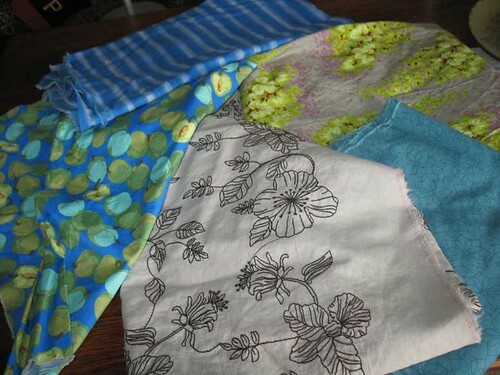 p1, *p1, slip 2 sts back to left needle, p2tog* to end. 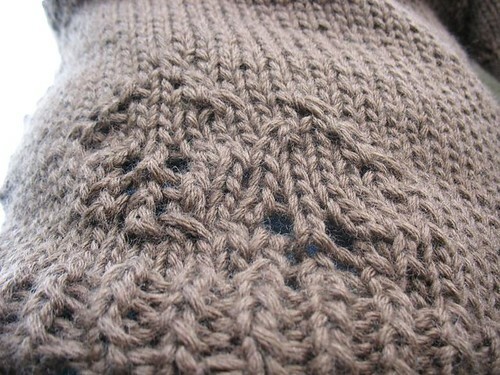 I love the transformation in texture that comes from stretching a knit to within an inch of its life. 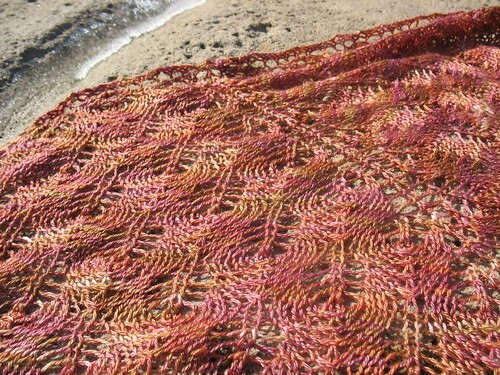 I wet-blocked this shawl, as I do most pieces–soaked it in the sink in Eucalan, squeezed it out, then pinned it down on the floor on an old towel. I have to say this colorway still doesn’t say “October” to me, but I have trouble pinning down what seasonal references it makes me think of instead. I’d say spring off the top of my head, because of the pastel tones, but the real-life referents for me would be dahlias, peaches, apricots–late summer? It was only half the size of her doubled fist, and made in lobes so that it looked almost heart-shaped. 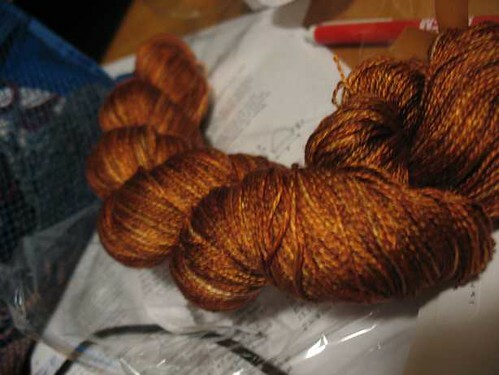 Rose gold in color, very dark, it shone like amber in the morning light. The fruit was warm to her touch; Solstar had baked it. Its smooth skin was covered with fine hairs, like bees’ fur. It came away easily from the stem when she pulled on it. The crystal leaves tinkled. The gnarled branches swayed. Its aroma was like honey browned in cinnamon. Aeriel felt weak. 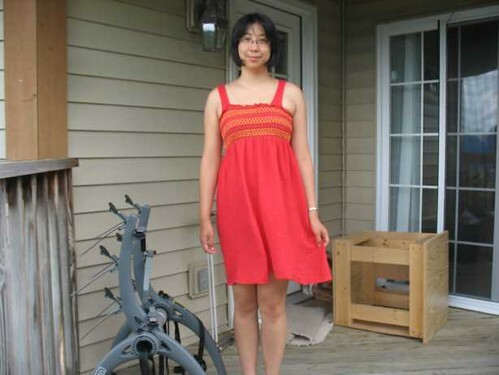 She brushed the fuzz; it fell away like reddish dust. Beneath, the skin was gold. She bit into the fruit. Its nectar was warm and sweet, the flesh tender and tasting of spice. 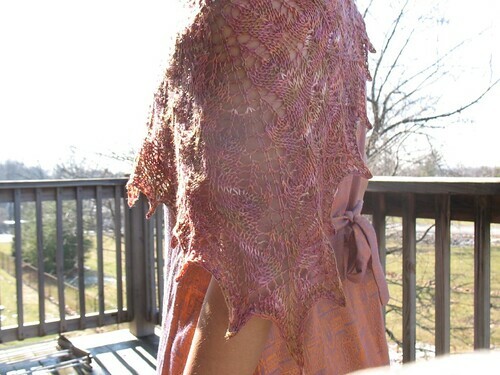 Just a quick preview of my Leaf Lace pullover from Loop-D-Loop –better pictures to come later, since unfortunately, most of my photos came out terribly overexposed or fuzzy. 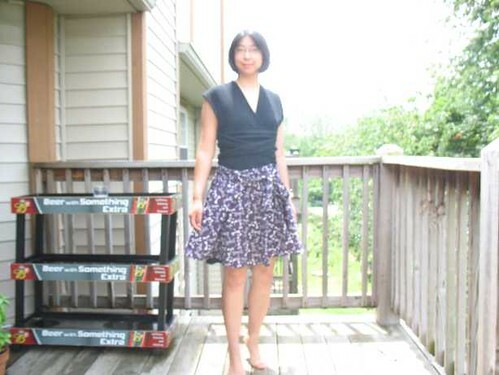 I love it, though the front of the neck really rides up and wrinkles (as you can see in these photos) since the back neck is at the same height as the front. The armholes are still a bit tight, but blocking improved the fit. You can’t see it too well in this photo, but I made a Sculpey button printed with a swallow to close the neckline. It looks like a Mentos. 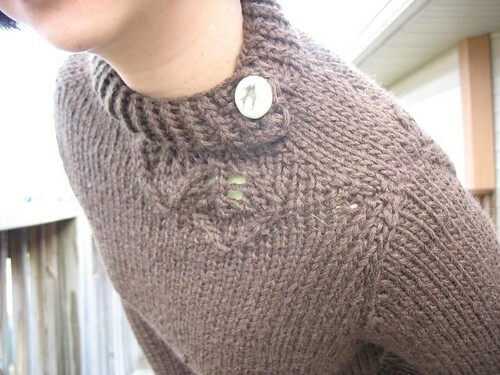 The color is a bit too light for the sweater, I think, but it’s quite pleasing anyway. 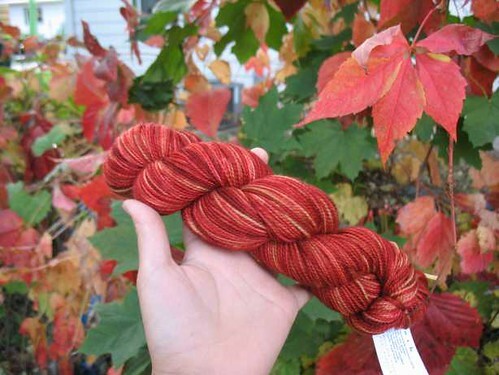 Sundara updated her shop yesterday with new sock yarns, and I succumbed to the cultish hype about her colors and ordered a skein. 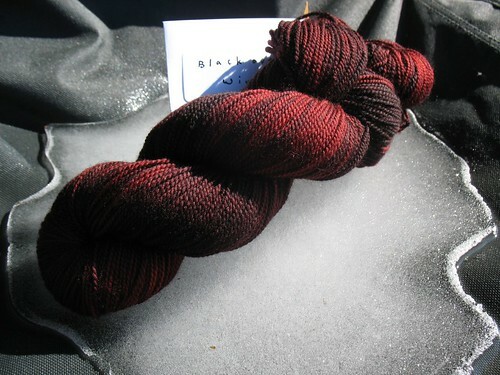 Even though I was an hour late to the sale, I got my first choice, a limited edition yarn called Black over Wine. 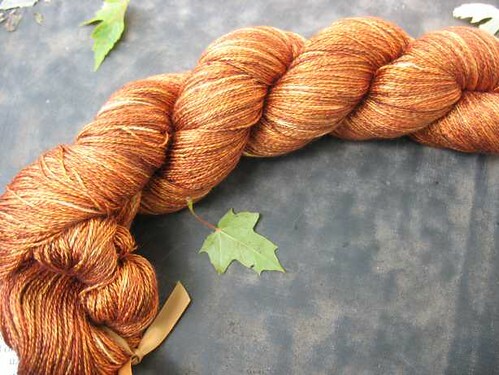 I have to admit that a certain doubt about my choice crept into my mind when I realized that as of today there are still two skeins left of it, while all of my other choices have completely vanished. 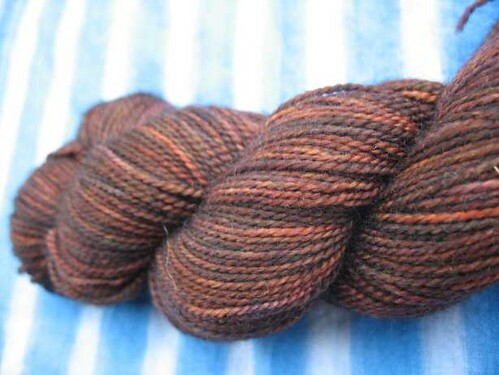 It’s not quite as unpopular as Evergreen Over Lime (8 skeins left) but all the others, the gray roses, autumn peaches, deep blue-purples, are all gone. Then I wondered what kind of brainless sheep I must be to think such a thing. I loved Black over Wine when I saw it, so why should other people’s opinions matter, especially considering other people haven’t seen it in person? I was on the fence about even ordering in the first place. 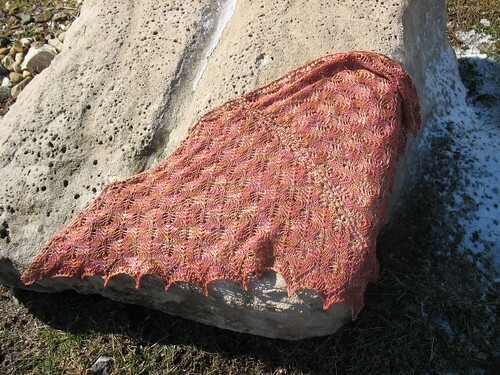 I didn’t want to succumb to the feeding frenzy that occurs when certain cult favorite yarns are posted for sale (Wollmeise at the Loopy Ewe comes to mind). 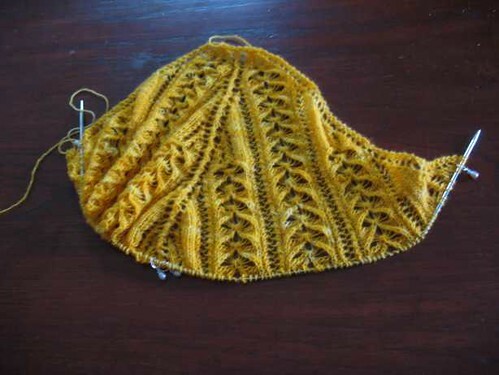 But I keep seeing gorgeous finished objects posted, with rave reviews of Sundara’s yarn, like Kristen’s February Baby Sweater and Emily’s Mossy socks–and of course the “celebrity endorsements” from superstar bloggers like Grumperina, Eunny, and Brooklyntweed. 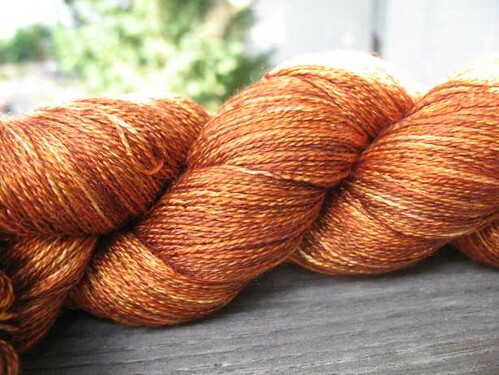 I’ve heard so many good things about this yarn. Hope it lives up to the hype! I’m not even sure what to make from it. Socks? Gloves? Mittens? A beret? 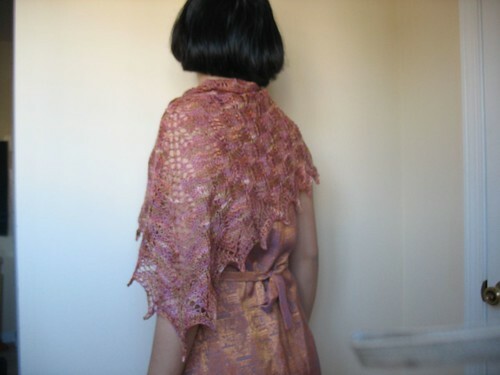 A lacy little shawl? A scarf? 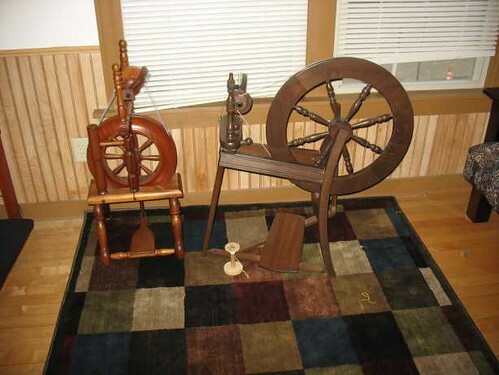 Oh, and on the subject of yarn shopping, I noticed the other day that A Verb for Keeping Warm sells all natural-dyed yarns and rovings: indigo, logwood, madder, etc. Pretty fascinating. I’ve also been using yarn up, in addition to just buying it. 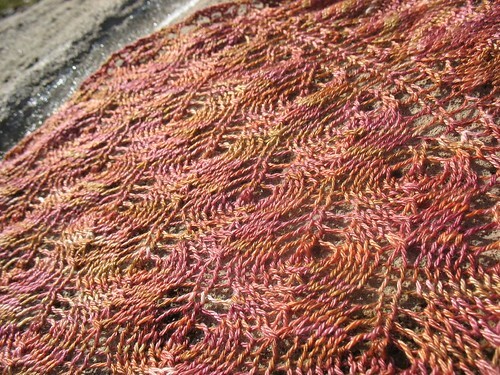 I finished the Loop-D-Loop Leaf Lace Pullover and hopefully will have some pictures of it soon. 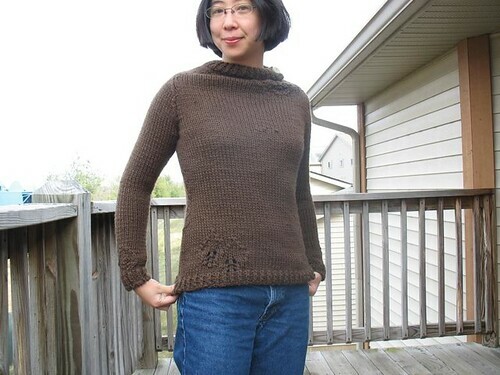 The shoulders and arms are a bit tight on me, and I’m hoping the wet-blocking I gave it last night will have fixed that. It seems terribly unfair that while my arms and shoulders are apparently linebackerish in proportion to my bust size, they possess all the strength of the mighty biceps of the Tyrannosaurus Rex.